Pugapoo, also known as the Pugoodle, is a cross between a Pug and a Miniature Poodle. 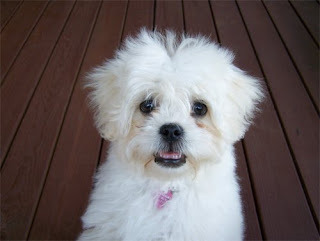 It is a none-shedding hypoallergenic small dog, which normally weighs 10-15 ponds. They may appear like the Pug or the Poodle and sometimes both in temperament as well as physical appearance. It is very sporty and is ever ready for running or games. Along with moderately long legs, they have a broad chest and well-sprung rib cage with a straight back and a curled up tail. The neck is short while the ears are bigger than that of the Pug but the eyes on the other hand even though less prominent are darkened, observant and expressive. Muzzles may be with or without a beard and varies in size from very short to moderately long. The coat may either be like that of a Poodle, i.e long and curly, or like that of a Pug i.e very short and straight. In certain cases of Pugapoo one may experience a combination coat that is straight and short on the body and long and curled on the legs, ruff and tail. This breed is available is a variety of colors which range from tan with black marking through to white, creams, yellows, grays, apricots, blacks, chocolates or even part-colors with or without white markings. This breed, just like all other poodle hybrid breeds, gets along well with kids, people, dogs and other animals. They are very amiable and caring but are wary of strangers. These small dogs can account for an excellent traveling companions if given proper socialization and training and can also prove to be excellent pets for families or senior citizens. They are fun loving affectionate breed which prefers to be surrounded by their family. Because of the above reason they do not enjoy sitting outside or in kennels. They are not known for destruction if properly trained. Moreover, due to the ease of training, they are a good choice for novice or first time dog owners. Due to different coat types, Pugapoo require different grooming. Pugoodles with the Poodle coat i.e a long and curly coat will require regular, every other day grooming if not clipped. Whereas on the other hand, those having Pug-like coats would need grooming once a week only in order to remove dead hair. The pugapoo have poodle type coat will shed very little while the ones with pug-like coat may shed moderately and both types have fine silky hair which makes them suitable for people with allergies to hair dander. The Pugapoo is prone to eye infections. And hence the hair around the eyes must be carefully clipped and the eyes should be washed with a damp cloth at every grooming. Incase of tearing, the dog must be examined by a vet at the earliest. Moreover, ear must be regularly checked for wax. The pugapoos having short muzzles are also at a risk of heat stroke and hence should be monitored when exercising in the heat. Moreover, their teeth must be regularly cleaned and examined.